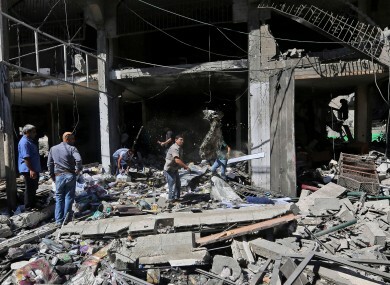 Israeli airstrikes continue to bombard Gaza today as the Palestinian death toll reaches 100. ISRAEL’S AERIEL BOMBARDMENT of Gaza claimed its 100th Palestinian life today as Hamas continued to fire rockets at central Israel and Washington offered to help broker a truce. Diplomatic efforts to end the hostilities between Israel and Hamas militants gathered pace, with US President Barack Obama phoning Israeli Prime Minister Benjamin Netanyahu. “The United States remains prepared to facilitate a cessation of hostilities,” the White House said. But despite mounting international concerns, truce efforts were falling on deaf ears, according to Egypt, which has played a key role in mediating previous Hamas-Israel ceasefires. “Egypt has communicated with all sides to halt violence against civilians and called on them to continue with the truce agreement signed in November 2012,” the foreign ministry said. After weeks of rising rocket fire on its south, Israel appeared bent on dealing a fatal blow to the Islamist movement Hamas, with Netanyahu reportedly saying talk of a ceasefire was “not even on the agenda”. And Ismail Haniya, Gaza’s former prime minister and the most senior Hamas official in the coastal enclave, also ruled out any end to hostilities. “(Israel) is the one that started this aggression and it must stop, because we are (simply) defending ourselves,” he said. On the other side, Israel’s military chief-of-staff, Benny Gantz, warned Gaza’s militants the army was intending to “broaden its activity as necessary, with all necessary force”. “Terrorists in Gaza made a grave mistake by attacking the people of Israel. They are bringing disaster upon themselves,” he wrote on his Twitter feed on Friday. Israel has confirmed preparations are under way for a possible ground attack, with tanks and artillery massed along the border and some 33,000 reserves mobilised out of the 40,000 approved by the cabinet. In Gaza, another eight Palestinians, including a woman and seven-year-old child, were killed in three separate Israeli air strikes on Friday, hiking the overall death toll to 100, medics said. More than 500 people in Gaza have been injured. So far, no-one in Israel has been killed, and less than a dozen people hurt, two of them seriously, medics said. A man in his 60s was badly hurt today when a rocket struck a petrol station in Ashdod, after a soldier was severely wounded in a mortar attack the night before, officials said. Over the past 24 hours, the army confirmed hitting 21 Hamas-owned structures, prompting a warning from the UN’s human rights office over the number of civilian casualties from strikes on homes. “Buildings that are ordinarily used for civilian purposes, such as homes, are presumed not to be legitimate military targets,” said spokeswoman Ravina Shamdasani. A group of 34 charities and NGOs also called for an end to the fighting. “Military actions by all parties must stop,” said a statement signed by groups including ActionAid, CARE, Oxfam and Save the Children. Email “Gaza death toll hits 100 as truce efforts waver”. Feedback on “Gaza death toll hits 100 as truce efforts waver”.